Usually one thinks of a film involving pandemic as some sort of insane race for survival that has action everywhere. However, this film takes a different route, delving more into a drama. Yet the result is proof that drama can work well with this subgenre of the usual science fiction film. A major epidemic has hit the world. An airborne-resistant pandemic has hit the world. The only safe place at this rate is in the air. Onboard a plane, pilot Tobias Black plans to stay in the air for as long as he can. Despite some of the passengers already infected, the remaining non-infected intend to stay that way for as long as possible. When one passenger learns his family couldn’t get onboard, he jumps off the plane. However, while the air is still safe, a major plane malfunction forces Tobias’ plane to land. Tobias and the other non-infected must find a way to get fuel while they hire one-armed mechanic Larry to fix the plane. As the group makes their way to find gas, some dark secrets are revealed amongst one survivor’s plan to “save humanity”. However, that becomes the least of their problems as some of the infected have conspired to hijack the plane, forcing the remaining ones in a fight to survive and keep the plane non-infected. Director Anthony Woodley and his screenwriting team have came up with something a little different with the world of the outbreak thriller, or pandemic. Usually, one would think of this set in either a modern day full of fights for survival or set in a post-apocalyptic world. Here, it is clear that the film has a post-apocalyptic edge but looks to have a modern-day setting. The film also delves more into a drama that perhaps Lifetime would show had it not been for their typical romance films which overdone can be quite vomit-inducing. However, this film’s drama does have the theme of sacrificing loved ones all in the name of survival. 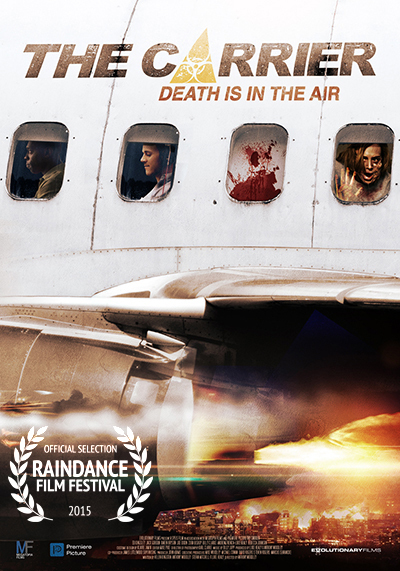 Edmund Kingsley shows pilot Tobias first as someone who is willing to keep the survivors in the air but slowly transitions into a no-nonsense fighter for survival when he is confronted by infected people on land. Jack Gordon, who has a resemblance to Aaron Taylor-Johnson, steals the show as he makes the most transition from a mild-mannered person to a strong fighter, especially when he discovers who is responsible for the plane landing. It is clear from the get-go that Joe Dixon’s Eric is a real villain as when he is in charge of inspecting the plane passengers, he maliciously beats a woman up for being infected. What is very interesting about the film is the state of mind of the infected people. Normally, these types would be somewhat primal or malicious. However, despite some of their actions towards those unaffected, they are still human and show that emotional side. There are some touching moments between the aforementioned beat up woman, who is infected, and her unaffected husband as well as one infected person pleading for his life mentioning he has a family. It is moments like this where this brand of pandemic thriller is somewhat different from most of these usual types. The Carrier takes the pandemic thriller and breaks away with some touching moments and dramatic effect amongst those infected and those unaffected. There are a few action touches in the third and final act and the cast does pretty well here. A recommended film for those who like the pandemic thriller but want something a little different. Evolutionary Films presents a SPEIS/Megatopia Films production. Director: Anthony Woodley. Producers: Luke Healy and Anthony Woodley. Writers: Luke Healy, Helen Kingston, Stefan Mitchell, and Anthony Woodley. Cinematography: Karl Clarke. Editing: Mike Pike. Cast: Edmund Kingsley, Jack Gordon, Karen Bryson, Joe Dixon, Zoe Bishop, Billy Clarke, Andrew French, Luke Healy, Rebecca Johnson, Walter Van Dyk, Josie Taylor.